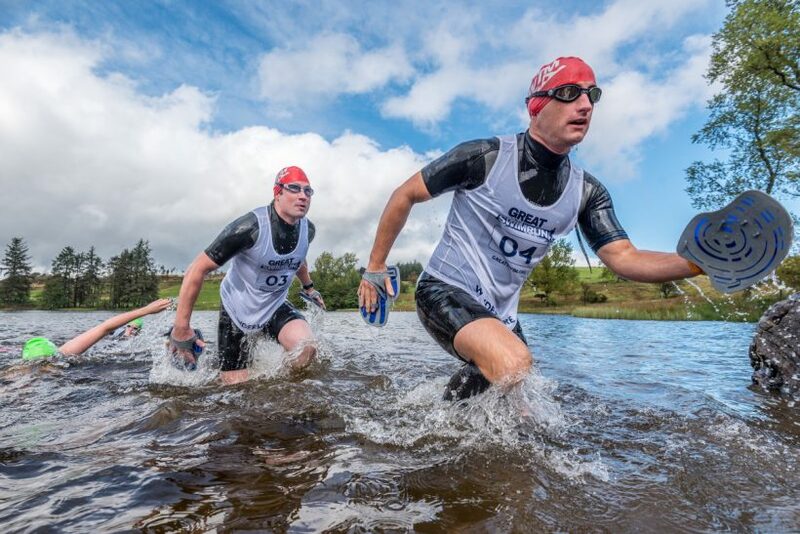 So you've trained hard for your SwimRun event - read our Race Day Advice information below to make sure you're fully prepared on the big day! These are tips and tricks that we have learned from taking part in 3 SwimRun events in different temperatures, and from competing in many long-distance events such as triathlons and marathons. Some of these tips may seem obvious, but they can be easily overlooked on Race Day; we have learned from hard experience! Don't try anything new on Race Day - stick to what you have practiced in your training, that includes kit - e.g. never wear new shoes or even new socks! Dry shoes and socks for after the race. A towel, either cotton or micro-fiber. Photo ID, medical certificate, and insurance if required. Beer money for after the race! Change of clothes if you are not staying very near the venue. 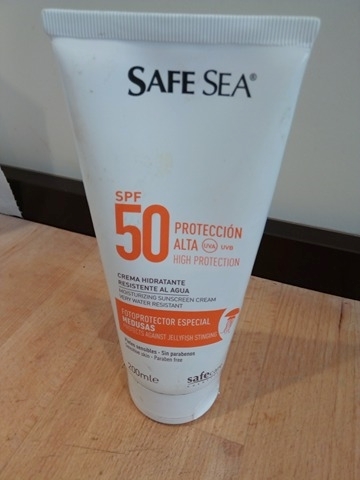 Sunscreen - if a warm climate event - if the swims are in the sea we use a sunscreen called Safe Sea that also protects against jellyfish stinging as well as being a sunblock - they simply slide off you! You can buy this great product on Amazon - here's the link! 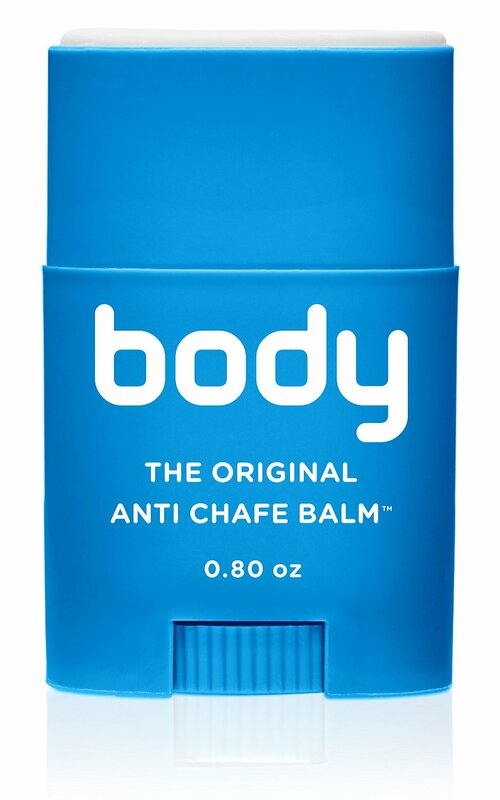 Take Bodyglide or a similar balm to help prevent chafing. We've found Bodyglide to be the best and it's wetsuit friendly too! It's much better than messy creams, gels or powder and very effective. Use under the neck of your wetsuit, and anywhere you may get rubbed - thighs, arms etc. Ladies may want to use under the base of their sports bra. This is also a good tip for long distance running! Click here for the best deals to buy Bodyglide. Take water to sip before the start, or an energy drink if that's what you're more used to - it's important to stay hydrated! If time allows, go to the race briefing at least 15 minutes before it starts, as you may be able to register and get your bib beforehand, so avoiding the big queues of other competitors afterwards. Wash your goggles thoroughly in detergent before the race to help prevent misting. Make sure you check out the route, distances and elevations before race day - we made the mistake of not checking elevations at Hvar and had a huge shock when we reached the big hill climb - we'd thought that part of the route was going to be a flat run! You can read more about our Hvar SwimRun experience here. Look at your nutrition requirements for the race. We've found that the 3 Sprint SwimRuns we've done only provided water, energy drink and the occasional banana or orange piece, so we've taken an extra energy gel with us for each race, and found we definitely needed them. Maybe because we took quite a long time to finish!! We like the High5 gels - we're used to these in our marathon training. Make sure you use a gel or some other form of nutrition that you have used during your SwimRun training. On the evening before the race have a carbohydrate-rich dinner and something that agrees with you - a hot curry could be a mistake! Pasta is of course a good option - as our last SwimRun was in Italy we had a lot of choice for our pre-race meal! On the morning of the race make sure you have a good breakfast, and again something you've eaten and drank before for your training sessions. Don't try something untested on race day! Our favorite is porridge with blueberries, at least 90 minutes before start time! Take a "selfie: before the race with your bibs - you may not look so great after the race finishes! 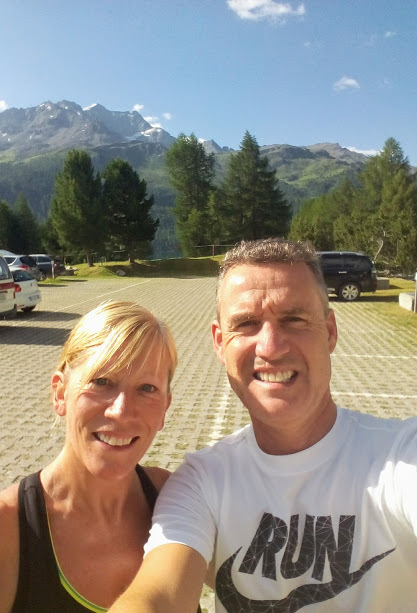 Here's our selfie before the Engadin race - we look a lot fresher than when we finished 2 hours and 37 minutes later! Race Day Advice - take a good "selfie" BEFORE the start! Before the start of the race, do a warm up. We find that some gentle stretching followed by 5 minutes of easy jogging works well. You want to get a little bit "out of breath", and get your muscles warmed up. If you are not sure where to start in the race 'pen', start in the middle or 3/4 of the way back in the pack. These events last for hours, so there is no sense in getting caught up in the starting scramble! Go at the correct pace for your team from the start gun - don't get carried away with the crowd and tire yourself out for later in the race - remember you have a long way to go! ALL research shows that you are better starting out slightly slower, and then gradually and slowly increasing your effort as the race progresses. At the end of the first run (which is usually a short one), make sure you go straight into the water for the first swim. Don't stop and look around. Just continue running, STRAIGHT INTO THE WATER. Have your hat and goggles on and ready for swimming 50 meters before the water - most teams start the race with hats on and goggles on their heads. In ALL races we have done, we have seen teams standing around at the water's edge, looking into the water and messing about with their equipment - we have passed many teams simply by running right on into the water and starting to swim as soon as possible! During the race make sure you take a drink at each water station - even if you think you don't need one - you may be more dehydrated than you think. Use folding drinks bottles - these are invaluable for the longer runs when you need a drink in between water stations. They fold up really small and fit in your pocket if wearing a wetsuit, or race belt if wearing a tri-suit. There are many on the market but click here for a good deal on a set of 3 folding bottles. Just fill it up at the water station, drink during your run, then fold and pack away before the next water entry point. Many SwimRun events now insist on you having your own reusable drink bottle, to save on the use of plastic. This is true of the Otillo and Breca events. Make sure you are ready for each transition by preparing for it before you reach it - ie. put on your hat, your goggles, and zip up your wetsuit before you reach the swim entries, and link your tow rope if you have one. In Ötillö events - look tough if you want to get a photo put on their website - this is the advice we were given by Michael Lemmel (Race Director) at the start of the Engadin SwimRun! - read more about our adventures at this SwimRun here. Save some energy so you exit the water ready for your final run! We have found that during the last swim of the race it is a good idea to stay just behind the couple in front of you, if they are CLOSE and swimming at a similar pace. You can tuck in RIGHT BEHIND them, and "draft" them, saving your energy for the final run. Then you will have more energy to get past them on the final RUN. Save a bit of energy for your sprint finish to the line! We try to do this in our marathons - Mogsy always seems to have slightly more energy than Richard for the last 200m of a marathon! You will have more chance of getting past fellow competitors near the line, AND look better on those finish-line photographs! Enjoy your post race beers and food - we find we are always thirsty and hungry after a SwimRun, especially a salt water event. 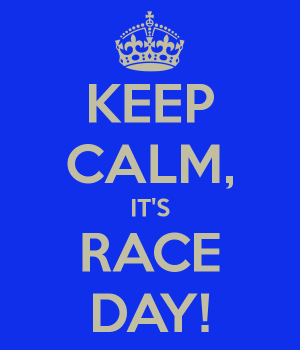 ENJOY YOURSELF AND HAVE A GREAT RACE! 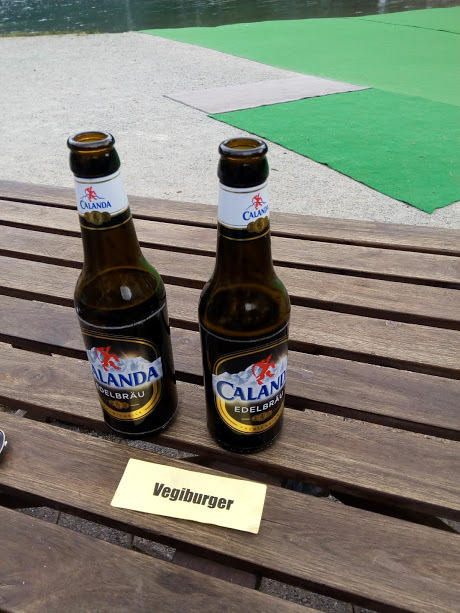 Post Race Beers and Vegi-burgers!